Feeling nostalgic for a classic slots game? With everything you love about one-armed-bandits spliced together with one seriously cool, new feature, Super Win 7s is the mobile slots game you never knew you needed…until now. 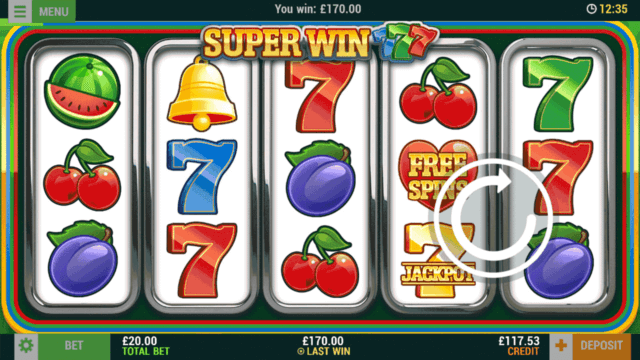 Super Win 7s from mFortune Casino features all your favourite retro slots symbols across 20 fixed win lines. There’s one big difference between this mobile slots game, and the old-school fruities you used to play: this one has an awesome mini-game where you can scratch your way to a mega multiplier win. Take this game for a spin today, and see if you can spin in a super win – or maybe even that huge progressive Jackpot! Super Win 7s mobile slots is compatible with iOS 10 and Android 5 and above. You can also play it on a desktop, laptop, or mobile device in HTML mode. You don’t need to be a super-hero to play with Super Win 7s! All you need is a compatible device and an mFortune Casino account. Got them both? Just tap “Play For Real” from the game menu to get started. Super Win 7s is fixed to 20 win lines – which means you play all 20 win lines with every spin – so the only thing you need to decide is your bet-per-line. You can bet anything from 1p a line to £10 a line, and you can adjust this figure by tapping ‘Bet’ and using the ‘+’ and ‘-‘ arrows. As you change your bet-per-line, the amount displayed next to ‘Total Bet’ will adjust automatically too. This is how much you will spend per spin, so keep an eye on this. If you bet 1p a line for instance, your Total Bet will be 20p and so on. When you’re happy, tap the white arrow to spin the reels. Tired of tapping that spin button repeatedly? Give the ‘Auto Spin’ function a try! Tap ‘Bet’ and select ‘Auto Spin’ to set this up and send the Super Win 7s reels spinning on their own. Just choose a number of automatic spins, a credit limit, and a maximum win amount, then tap the arrow to start your Auto Spins. These spins will come to a stop when you run out of spins, reach your credit limit, or spin in a win that exceeds you total win amount. You can also take back control at any time by tapping ‘Stop’. This will revert the game back to manual play. Before you set your bet-per-line and start spinning, you’ll want to know how to tell if you’ve spun in a win on Super Win 7s, right? It’s cherry easy to tell because our win lines always pay from left to right, and any winning lines – and your prize amount – will be highlighted on screen. You could bag yourself a plummin’ big win in Super Win 7s if you spin in a winning combination of symbols on an active win line. You’ll need to spin in three of the same symbol and if you do, you’ll be awarded a multiplier of your original bet-per-line. Things get more super if you spin in wins across more than one active win line with a single spin, because we’ll add these together before they’re added to your credit. If you spin in more than one win on a single win line, only the highest win-per-line will be paid. If you come across a diamond in the rough – well, on the Super Win 7s reels – you could grab yourself a 24 carat win. That’s because this is your Wild symbol, and Wilds can substitute for almost all other symbol and turn a losing spin into a winning one. For instance, lining up two cherries on an active win line wouldn’t normally be enough to award a win. Line up two cherry symbols and a diamond Wild though, and you’ll be awarded the multiplier of your original bet-per-line you would have received for three cherries. Tasty! We hope this won’t make you feel too bitter, but we need to remind you that Wilds won’t substitute for Mini-Game and Free Spins symbols, nor can you win the Super Win 7s progressive Jackpot where you line up Wilds alongside your Jackpot symbol. You can only win the top prize with five golden 7 symbols. Ding, ding! That’s the sound of the Super Win 7s mini-game calling! Spin in 3 or more bell symbols anywhere on the reels to play Cash Cards and see if you can scratch your way to a mega multiplier win. Cash Cards is a scratch-card based mini-game and when you activate it, you’ll have a choice of cards. The number of cards you can choose from – and the maximum multipliers on offer with each card – depends on the number of bell symbols you spin in on the main reels. When you’ve chosen a card, it’s time to scratch off the panels and see if you’ve bagged a win! The winning combinations and associated prizes are shown to the left of the panels. Uncover a winning selection of symbols, and you’ll exit Cash Cards and return to the main reels with your win. If it’s a losing card, you’ll go back to Super Win 7s empty handed. If you’re not already in love with Super Win 7s, this is something that’ll get your heart racing. Spin in 3, 4, or 5 Free Spins hearts symbols anywhere on the reels, and you’ll be awarded 7, 14, or 21 respective free spins. As the name suggests, these spins won’t cost you a penny but they will be locked to the last bet amount played. That’s enough to leave you in seventh heaven though, right? Take Super Win 7s for a spin today, and play a classic fruity with a modern twist. Will you scratch your way to a mega multiplier? Will the golden 7s align and see you win that huge progressive Jackpot? Play today and find out! Not signed up to mFortune Casino yet? What are you waiting for? Register for your first and only account today, and you’ll receive a no deposit welcome bonus of £5* to use on any of our exclusive slots, bingo, or casino games. Not only that, but you can also get your first deposit up to £100 matched 100*%. Join and play Super Win 7s today. *18+. New players only. All bonuses awarded as bonus credit. 100% deposit match of first deposit, up to £100 and paid as bonus credit with a 1x wagering requirement. Bonus credit cannot be withdrawn. Max withdrawal without depositing is £200. You can withdraw any unspent deposit, in addition to the funds in your cashable credit account. T&Cs apply, BeGamble Aware. The occurrence of 5 (five) “JACKPOT” Jackpot symbols on an active win line awards a progressive Jackpot. The progressive Jackpot is available on any bet, with 0.005% of the bet being added to the progressive pot. There is no hidden reserve pot. When the Jackpot is won, it is reset and begins to rise again. Simultaneous wins can occur, if another player wins the progressive Jackpot then a notification to this effect would occur BEFORE the current player was awarded the Jackpot. The game Jackpot seed value is £2000. The Jackpot is individual for this game, it is not shared with any other games. In the event of a communication error after a progressive win result has been determined and before it has been displayed on screen, the win amount will automatically be transferred to the player’s account. While the game is live, the Jackpots cannot be terminated. Super Win 7s has a theoretical return to player of 94.4%. This is based on long term playback. System malfunctions void all payments. Monies are staked in the following order: winnings, player deposits, bonus credit. mFortune general terms and conditions apply.